L-R: General Manager, Lagos State Emergency Management Agency (LASEMA), Tiamiyu Adesina; Corporate Communications Manager, Nosak Group, Kenneth Adejumoh and Director of Operations, Femi Giwa, LASEMA during the donation of foodstuff and relief materials to victims of Itafaaji collapsed building and demolished distressed buildings in Lagos recently. As part of its social responsibility to the society, Nosak Group has donated food items and other relief materials to the victims of Ita-Faaji collapsed building and others from the demolished distressed buildings in Lagos Island. The presentation was held at the Lagos State Resettlement Centre located at Igando. 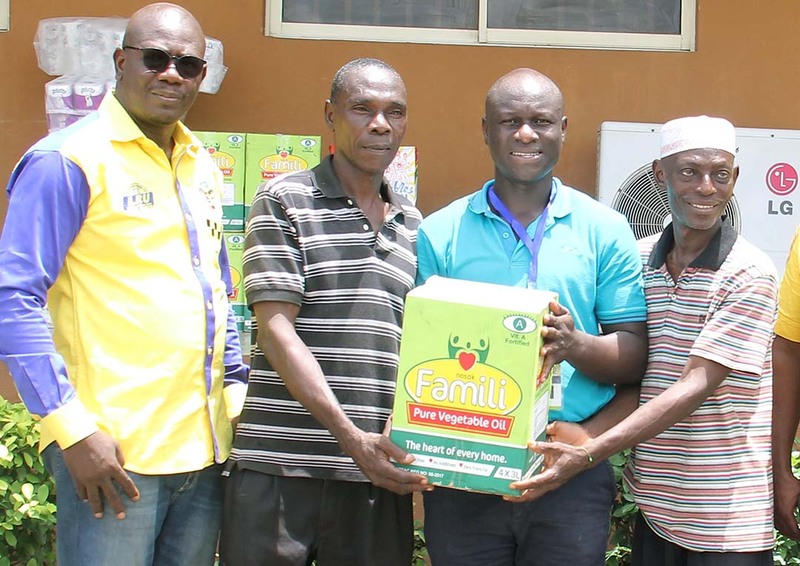 The Group Executive Director, Corporate Service, Nosak Group, Mr. Osagie Ogunbor, said the donation is in line with the company’s slogan, ‘touching lives everyday’ as well as in tandem with the corporate social responsibility policy of the company. 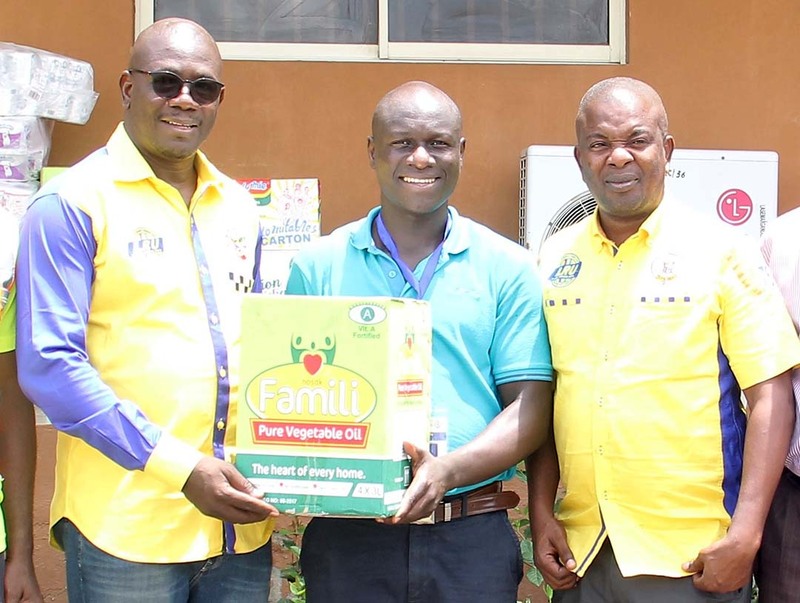 Ogunbor, who was represented by the Corporate Communications Manager of the Group, Mr. Kenneth Adejumoh, stated that the organization will continue to support the government and the people through its CSR initiatives to reach out to various communities especially in their time of need. Adejumoh, presenting the relief items, on behalf of the Group, said the donation was to validate the philosophy of touching lives every day. “We are here to demonstrate what we stand for and to show our support in your time of need. The government alone cannot carry on the task of providing shelter, provision of foodstuff and other items for your daily upkeep, that is why we have come to contribute our quota and to encourage you to remain strong as things get better for every one of you again”. Receiving the items on behalf of the victims, the General Manager, Lagos State Emergency Management Agency (LASEMA), Mr. Tiamiyu Adesina, appreciated Nosak Group for their care, saying the items presented by the company would go a long way to alleviate the predicament of the people. He used the opportunity to call on other corporate organizations and well-meaning Nigerians to do likewise in rendering support to communities and people in time of need. Speaking on behalf of the over 400 inhabitants at the center, Mr. Adekunle Ajiba and Mr Danile Ikpefuran lauded Nosak Group for the kind gesture. Relieve items donated included cartons of Nosak Famili Pure Vegetable Oil, bags of rice, cartons of Noodles, toiletries, among others.